Black pepper spice and violets on the nose, on the palate firm tannin and a fresh acidity that promises great ageing potential. The 2015 Shiraz shows textbook black pepper spice and violets on the nose, with hints of Cape fynbos and black currant. The intense fruit flavours follow on the palate with firm tannin and a fresh acidity that promises great ageing potential. The grapes were handed picked at ±24º Balling and fermented in closed tanks. Pump-overs were done every 4 hour for the first half of fermentation. Post-fermentation maceration was done for about 4 weeks. The wines were matured for 14 months in 24% in New French Oak, 42% 2nd fill, 30% 3rd fill barrels and 4% 4th fill barrels. 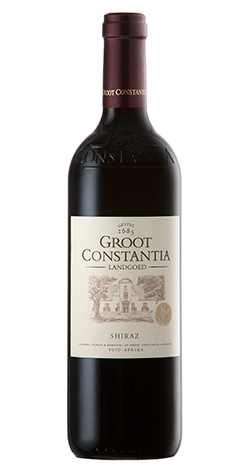 The estate is today owned by the Groot Constantia Trust, an association incorporated under Section 21 of the Companies Act of 1973, which is committed to maintain and restore this national monument which is South Africa's oldest and best known wine estate. From Shari Schumacher of Palm Harbor, Florida on 9/19/2018 .